I am trying in R to "center" a matrix (i.e. remove mean) group-wise (i.e. remove group means for each variable). Input is a matrix (including the grouping variable), and output is the same matrix, where columns are now group-wise centered (possibly excluding now grouping variable). Using data.table: same as above, but in 2 steps: instead of over-writing variables, 1) add mean variables as new columns, 2) then compute differences, splitting the original matrix as two different matrices. Results in terms of speed are: 3 < 2 < 1. 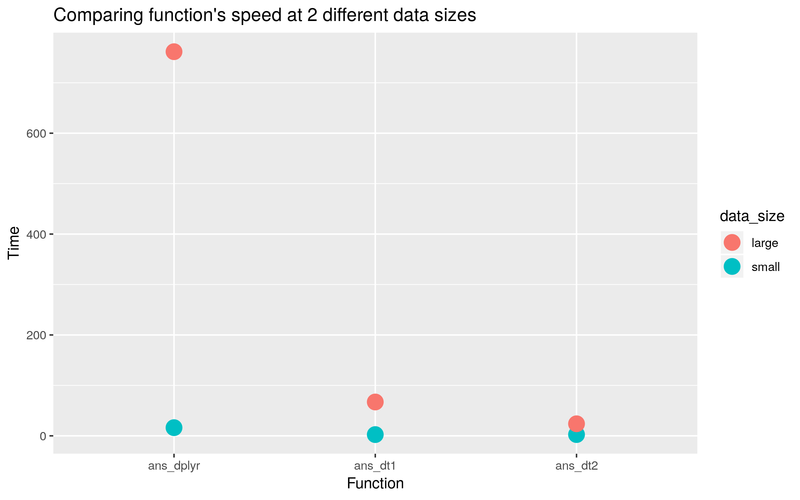 (3) being faster than (2) is surprising (as (2) is just overwriting variables, not adding)... I suspect it could be from the fact that using function(x) x - mean(x) prevents data.table to use an optimised version of the mean function. Any way I can speed up some of the code? How can I understand (3) is faster than (2)? Can I get (2) to be faster? This answer only goes to how to speed up processing and doesn't get at the intricacies of data.table vs dplyr under the hood. Below is a slightly faster version (at least for larger datasets). Rather than create additional columns in the main DT, I created a new DT that had the mean values for each. As that had a 6-fold smaller size, the second DT has to be keyed and then joined back to the original. This produces a bunch of extra columns (with values from x), so that's why we only selection columns of [,1:length...]. Note that subtraction of two DTs ignores column labels and assumes the same order of all the columns - i.e without the setcolorder, mean_x has "cell" being the first column, which results in the wrong columns being subtracted. Not the answer you're looking for? Browse other questions tagged performance matrix r or ask your own question.